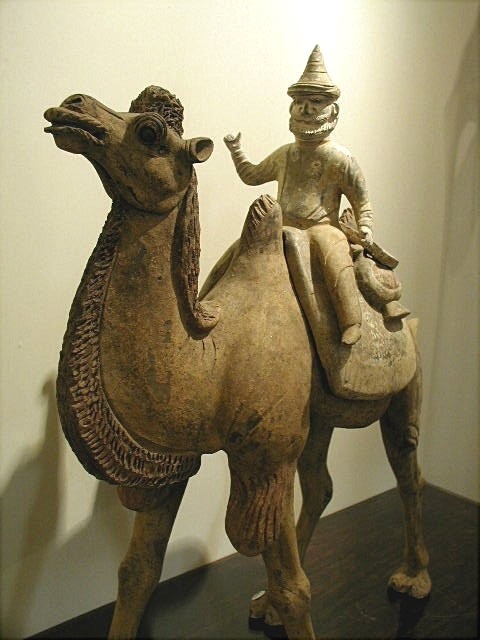 Closer front view of large striding camel with foreign rider traveling with his dog on saddle. Fine details of fur on the head, neck and front legs. Detachable saddle pack supporting flask, carpet and vessel. Pottery, painted/unglazed. H.26.75 in (67.9 cm), L. 25 in (63.5 cm). Oxford T.L. tested.